These funny guys have found their way into more cartoons than almost any other bird. Because we know their features so well, we're free to draw them however we would like as long as we include the basics - the black-and-white tux, flipper hands and a stiff chubby body. 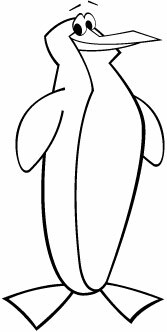 There is really only one rule that you never want to break when you draw a penguin - it has to be cute! One way to make them cute is by plopping their body down on some oversized feet. That stubby look makes them adorable and a sure winner with penguin fans. That's the basics. Let's draw!